Select dates to see price*. 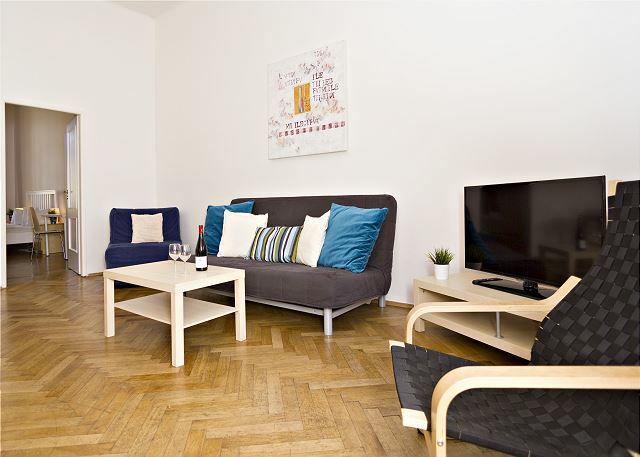 This apartment is comfortable, modern, practical and perfectly located, to ensure you have a great stay in Prague. 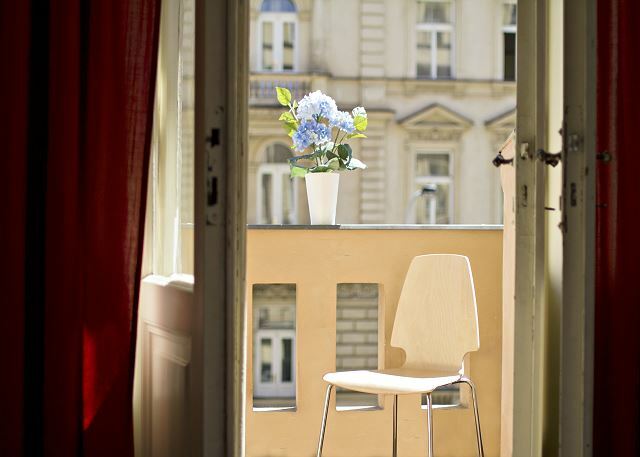 Prima is situated in the very heart of Prague, within only a 10 minute walk to Charles Bridge and 5 minute walk to the Vltava River. Most of Prague’s historical sights, culture and other interesting places are within a maximum of 30 minutes. 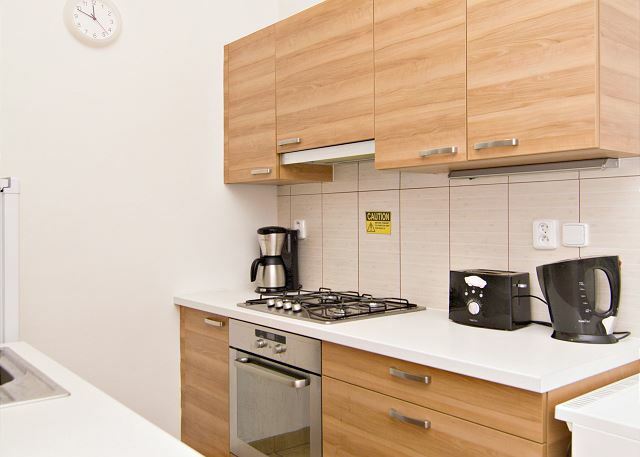 If you prefer to cook and dine at "home" you will appreciate Prima’s modern kitchen, well equipped to prepare simple meals (coffee maker, microwave, toaster, apartment is an ideal spot for relaxing after a long day of exploring Prague. Due to its convenient location, you can refresh yourself during the day or a long night, and then go back the center of the city. Prague's most popular restaurants and bars are only a few minutes away. The apartment is large enough for 4-7 people. It has two spacious bedrooms and a sofa bed in the living room. 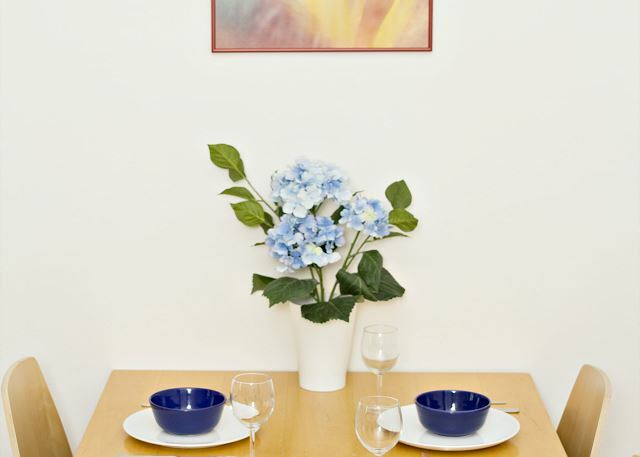 As well as all our apartments, there is a high speed internet connection for those who wish to work or stay in touch with friends. 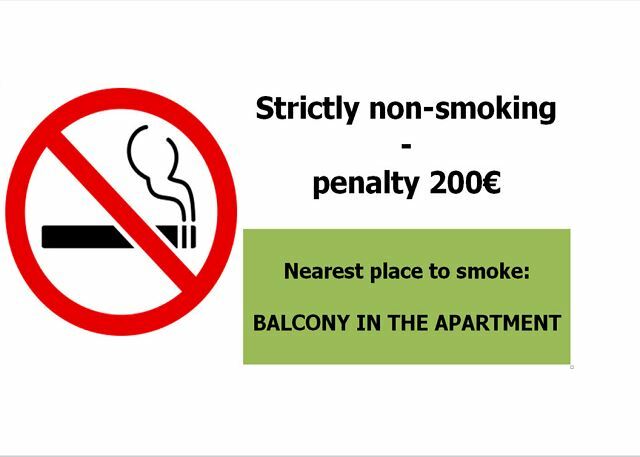 It is also non-smoking with the option of smoking on the balcony. 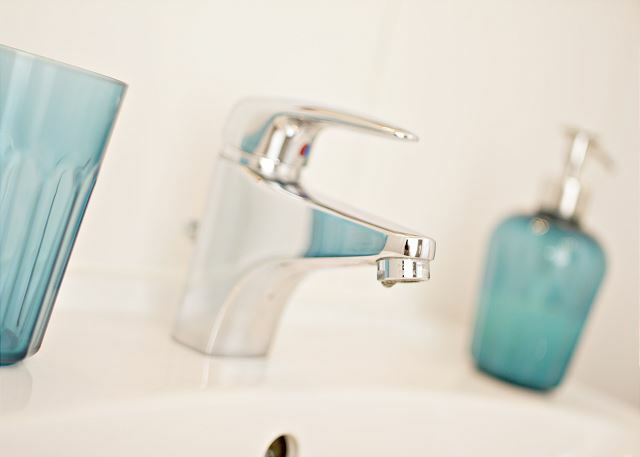 On the practical side, the apartment is equipped with lock codes which give you free access without keys. 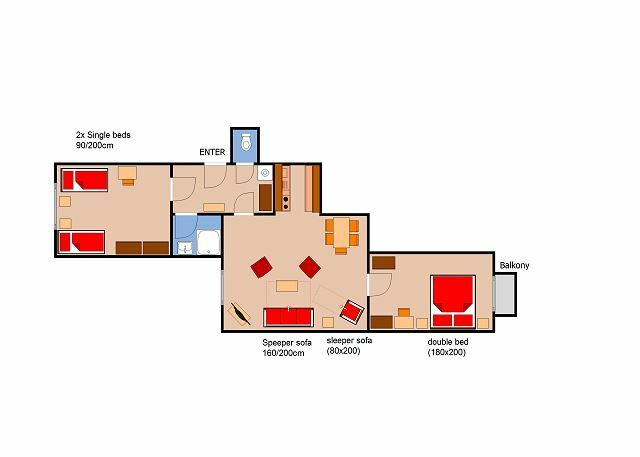 To get a better idea of what the apartment looks like, scroll down to view the floor plan. 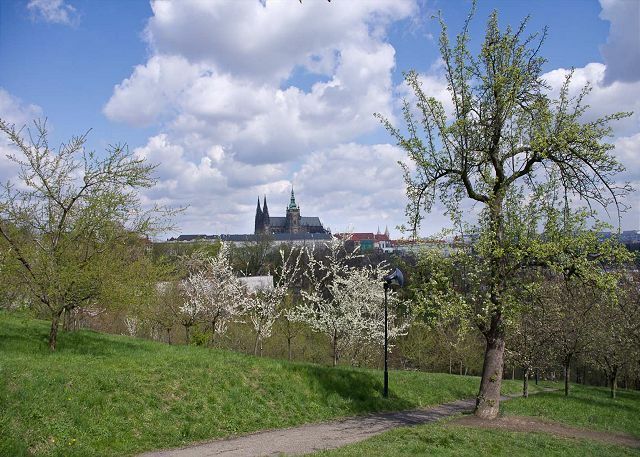 The apartment building is located under the Petrin hill, near the river in the area called Mala Strana. 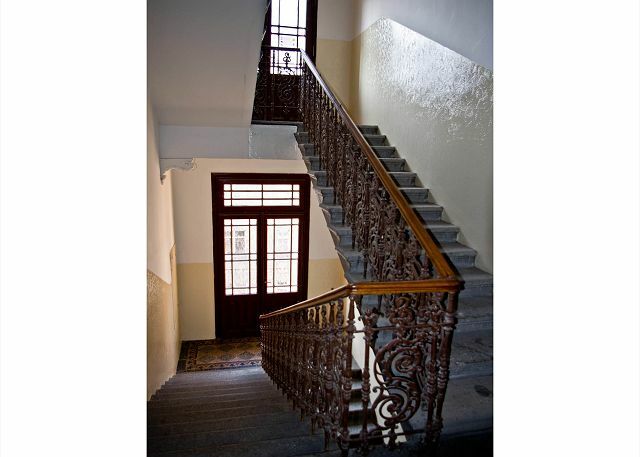 It was built in 1895 by a well-known architect, who built it for himself, explaining its good qualities. Petrin is undoubtedly the best place for those who like visiting tourist attractions as well as having a taste of nature at the same time. Just behind the building is the historical Hunger Wall, which has served to defend Prague. In 1361, the year of drought and poor harvests, the prices of bread increased severely, which left many people without enough food. In order to feed their families, the locals resorted to frequent theft, augmenting the criminal activity. King Charles IV therefore called upon the locals to build a protective wall from Petrin to the Vltava River. The construction took two years and fed many families, resolving the problem. The Prague people named the wall “The Hunger Wall”, because its battlements resembled the teeth of the starving folks building it. 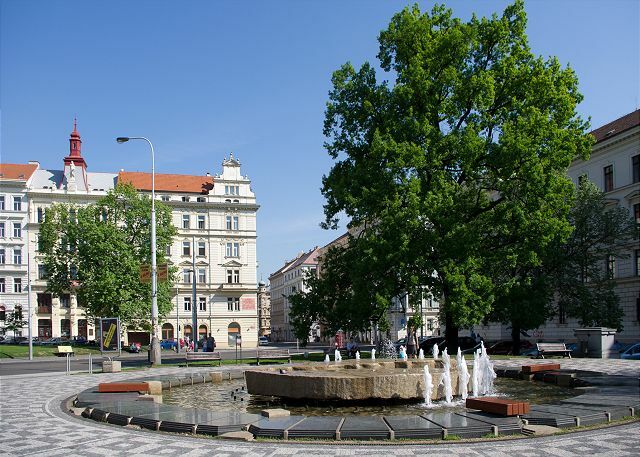 At the end of the street is Kinsky Square, known especially for the T34 tank, which commemorated the liberation of Prague by the Soviets in 1944. After the Velvet Revolution in 1989 an artist David Cerny painted it pink. Actually, it was not so much of a political gesture as an attempt to capture the attention of some girl. Later a fountain was built in the original location where the tank stood, but there still a little pink part of it on the square which constantly reminds us of our history. 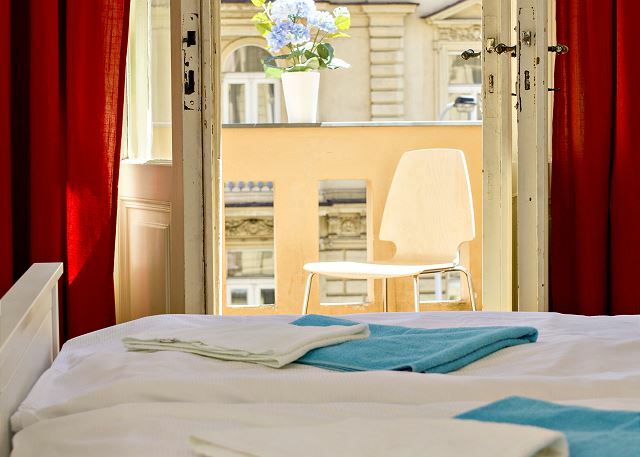 The apartment is also near the French Quarter, only a 5 minute walk from the French Lycée. For those who plan to stay in Prague for a bit longer, will appreciate the proximity to a nearby shopping center called Novy Smíchov, which is only 2 tram stops away. The tram stop (tram line 6, 9, 12, 20, 22) is right in front of the building as well as a bus stop, line 176. 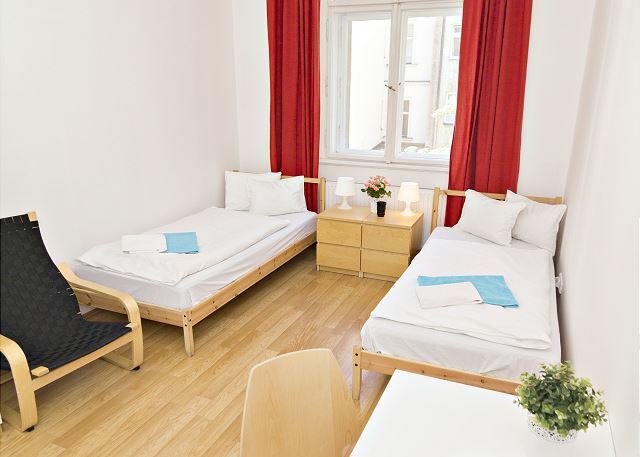 We found our Rentago apartment in Prague to be very large and comfortable. The kitchen had everything we needed for the week and there were plenty of sheets and towels. When the handle in the room where the toilet was fell off, the team from Rentago was very responsive and sent someone to fix it right away. I would definitely rent from Rentago in the future. Plenty of space here at a very reasonable price - would sleep 6 ok, 4 totally comfortably. 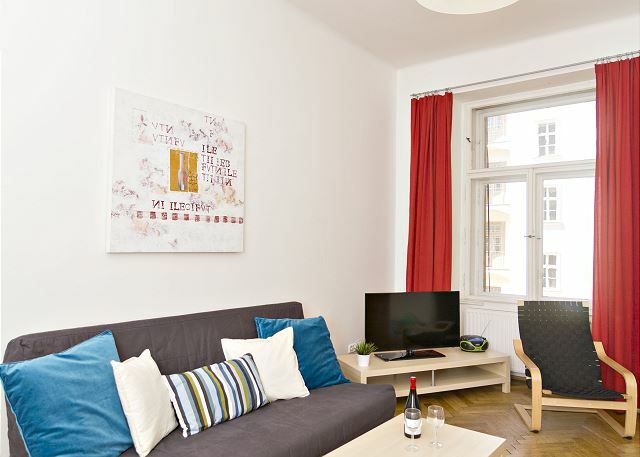 Location is really nice, outside of the centre and close to the cable car, 10/15 minute walk to Charles’s bridge. We stayed three nights at RenteGo Prima. It well worth the money. The keyless access is very convenient. Walking distance to Charles bridge and we also walked to the Student Agency bus station to CK, takes about 15 minutes. The team support is very responsive and professional! The only thing bothered me was the blanket was single size and could not cover the sofa bed.... Overall it was a pleasant stay, would like to recommend to others. We had the most amazing weekend stay in Prague, 29Oct-2Nov 2017. 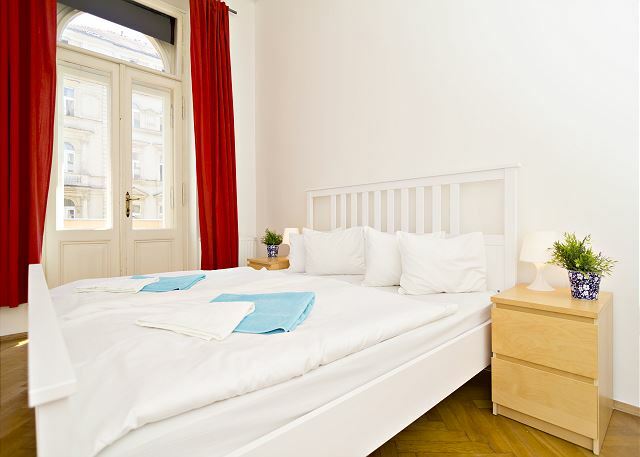 The apartment is nicely situated very centrally in Prague, close to all major tourist spots. Everything worked nicely with door codes etc. The apartment is well equipped. 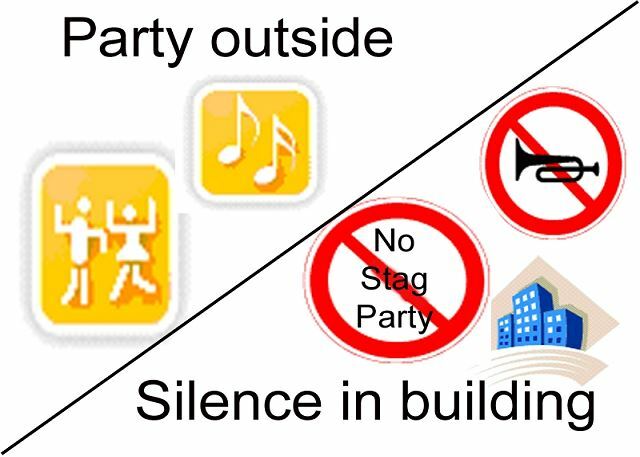 The location is a bit noisy from the trams but did not disturb us much. The apartment was clean and in good shape. I liked the kitchen in particular and the range of equipment. It made cooking as a group really fun. Most of Pragues tourist attractions are easily accessible by foot from here, and two tram stations are right next to the building. Shopping is also easy with more than enough stores in range. 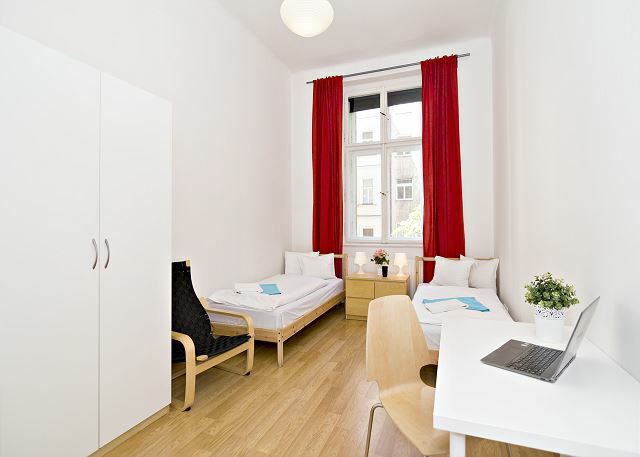 Finally, I also liked the idea of a luggage storage room, allowing for a pleasant final day in Prague. Only the mails with the booking information were sometimes confusing. 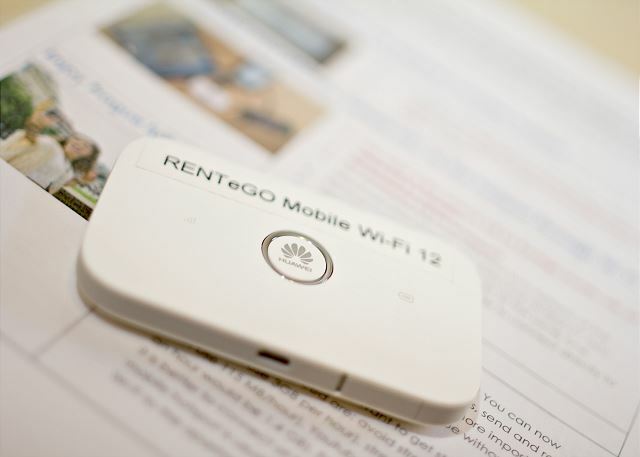 Good communication with the service management of RENTeGO. Before, while and after our stay. Little shortcomings were taken care of immediately. 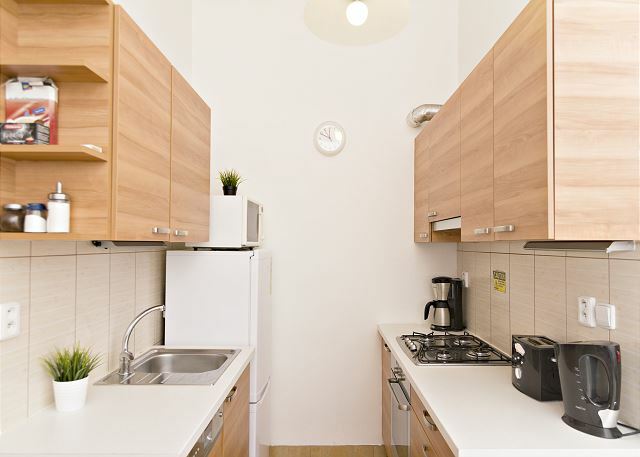 Town, apartment and organization are recommendable! The property was in general good condition. We really enjoyed the size of the flat, and that there was a balcony. Towels and bedding were clean,so was bathroom and kitchen, but overall were the floors really dirty.Because of heavy rain got the balcony overflooded, with a blocked drain, so the last days of our stay, was it impossible for us to use it. We stayed in this flat for one week. Three times this week had someone been in the flat and once left the balcony door open. We did not miss anything of our belongings, and we suppose it had been someone from the management visiting, when we were out. But we disliked it strongly, and felt insecure and felt it like we had been watched. We never saw any of the management during our stay, but we talked to them on the phone. We would have prefered to meet someone in personal the day we arrived.Prague is a beautiful city, and staying in Prague was a great experience for us. Dear Sieglind, it's nice to hear you enjoyed your time in the beautiful city of Prague. We are sorry about the shortcomings you mentioned and we assure you this was an exceptional situation, since normally we always inform our guests about anyone coming in to the apartment to for reparations etc., so thank you for mentioning that, our technician will be more careful. Of course, there are ups and downs regarding the self check-in process and we are aware that some clients prefer more personal approach, therefore we would like to encourage any of our future guests who might read this to inform us on their preferences and we will try to accommodate your requirements. Otherwise we hope you had a great stay in Prague and we hope to host you again soon, Sieglind! Apartment even larger than appears in pictures. 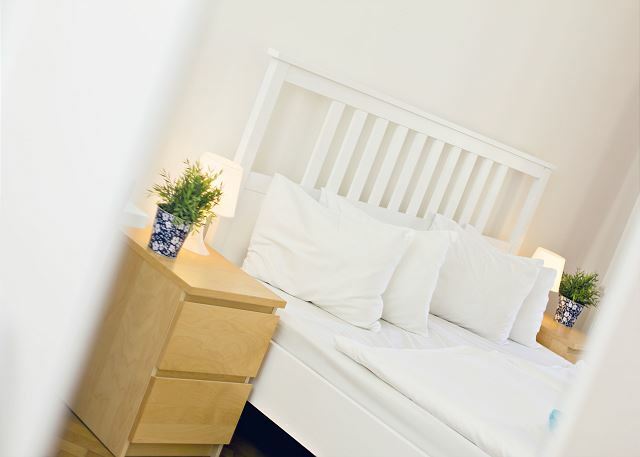 Basically furnished with comfortable beds and pillows, towels provided and 2 refrigerators. 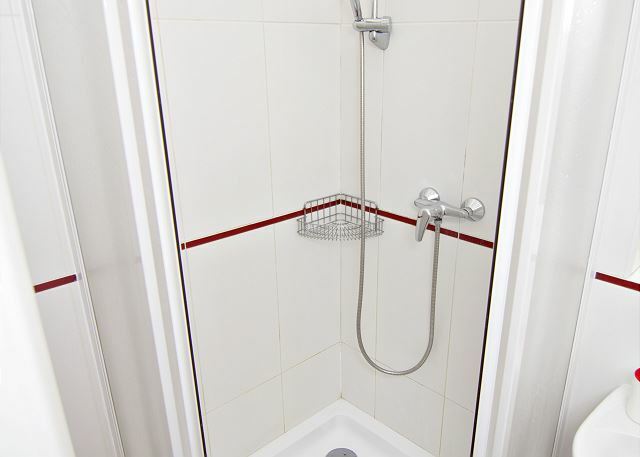 Wonderful location in a safe and quiet area with perfect access to tram. Thank you ver much Jereme! We had a great stay for the price. 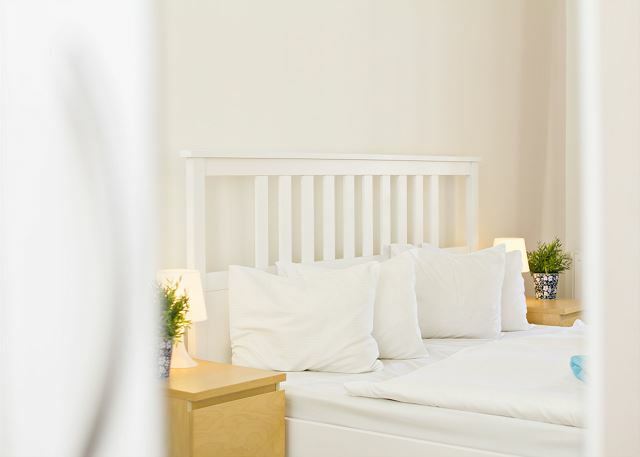 The master bed could be improved upon. Clean and near to everything. The flooring needs work and the balcony door did not lock. Thank you very much for your remarks, our technician is going to check these issues. We are looking forward to your next visit. When we reached the flat, there was garbage piled in the kitchen, a door broken in the apartment and overall not cleaned and ready after tge previous tenant. When we called, around 11 ish, the staff person organised a taxi to a new location and met us there. Next morning, we had a drop off to the original appt and it was clean and comfortable. We needed an extra fan and that was delivered as soon as possible. The appt was perfect, but the best was the understanding, quickness of response and the help given by the staff. They also sais they would reimburse one nights stay, which was very considerate and took care of the transport as well. They were very proactive and gave us an extention of check out timing as our flight was later that evening, even without us having requested it!! An absolutely amazing team!! Location was better than expected. Easy access to the tram, nice park with a playground near by, interesting, safe neighborhood. Thank you Gregory, we are glad you were satisfied with the location of the apartment Prima! 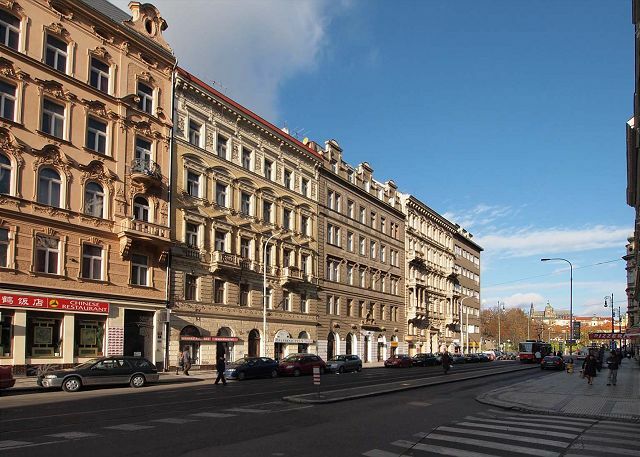 It's really a nice neighbourhood with many nice restaurants and bars close to the apartment and within walking distance from all the major attractions of Prague. 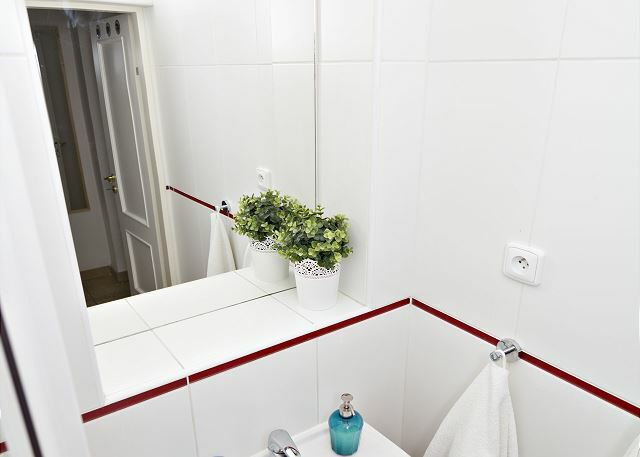 very nice and central located flat next to the city center. everything is in walking distance. like to stay there next time. Thank you very much Steffen. See you next time! That's really nice to hear, Tatiana. 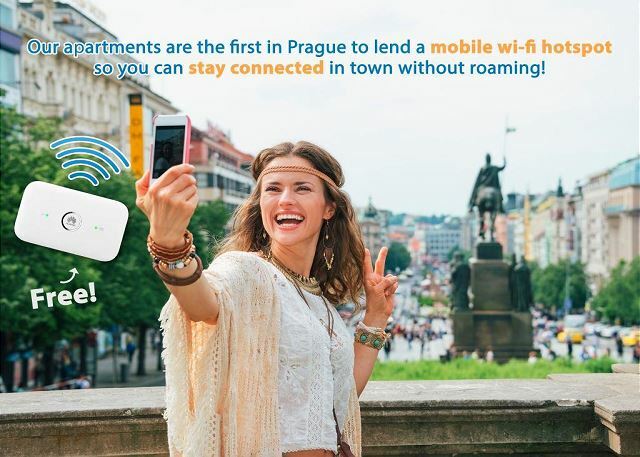 Feel free to contact us for your next trip to Prague! Very nice place? quiet and near everything in town. We were two couples and we spend there three nights. The apartment was just perfect for us! Four of us stayed at Prima over Christmas. For two of us, this was our second time renting from RENTEGO. We enjoyed the spacious apartment. The WiFi signal was strong, which is not always the case in rental apartments. The only time we took public transportation was to the train station upon arrival and at departure. 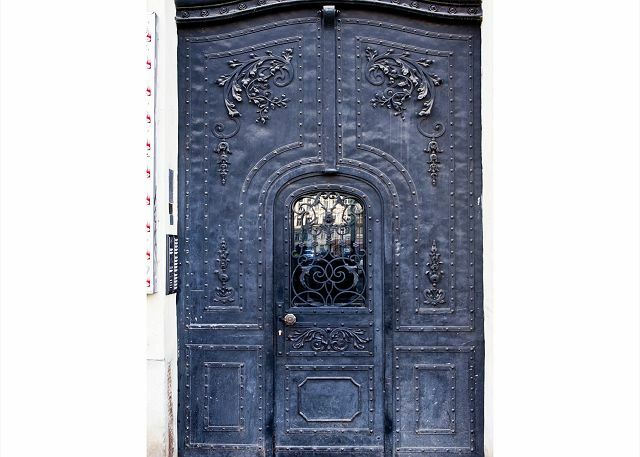 Do not have keys but only codes to unlock all the doors is really a very convenient feature that makes it easy for even the steps of check in and check out. 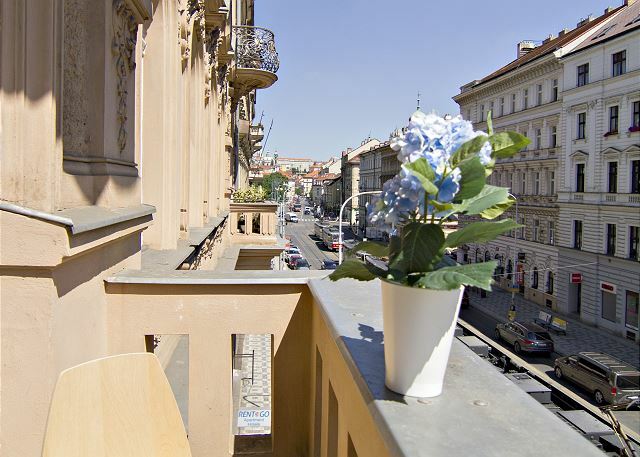 The position of "Prima" allows you to live in a quiet and convenient district, being able to easily reach the heart of Prague with a few steps. The parking situation is really awkward however. I left my car in a parking lot P & R for five days. on a passé un agréable moment dans cet appartement. il est très bien situé et très bien équipé. It was an amazing experience.. One that we would definitely repeat.. Everyone was so professional and sweet.. All our needs were accommodated.. We would recommend it to our friends and family. Une semaine très riche sur le plan culturel ! L'appartement est très bien situé : nous avons visité tout le centre historique à pied ! De nombreux petits commerces, tout proches, nous ont permis de faire les courses quand nous rentrions le soir. La pluie abondante ne nous empêche pas d'être très satisfaits de notre semaine. We very much enjoyed our stay in the Prima appartment. 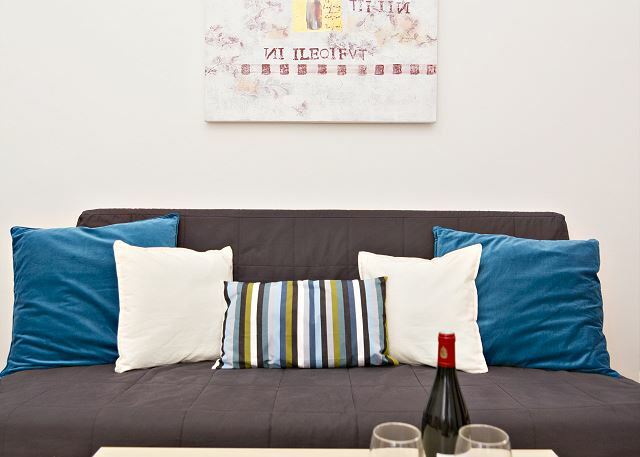 It was spacious and well appointed and very convenient for walking and public trasport to the centre of the city. Nous avons passé un très bon séjour, conforme en tous points à nos attentes. La situation est excellente, nous nous sommes garé gratuitement sans soucis dans une rue à proximité de l'appartement. L'ensemble des visites a été fait à pieds. L'appartement est très bien pour 4. Un peu de déco non scandinave serait un plus mais pour 4 jours ce n'est vraiment pas essentiel. Je recommande rentego. Très bon séjour à Prague ! Nous sommes très contents des prestations de Rentego (contacts par mails, réponses rapides,...), appartement (prima) vaste et bien placé, personnel charmant ((là-bas il vaut mieux parler anglais, par contre aucun souci pour les communications en français par mail ou téléphone). A very nice place to be, great value for money and a beautiful location for sight seeing Praque. A enjoyable organization with a good focus on clients needs and helpfull. We recommend the organization and the place. Mous sommes venus en décembre pour 4 joours. L'appartement a comblé tous nos besoins. nous étions 4 filles, il y avait de la place et tous les accessoires disponibles. Nous avons manqué d'eau chaude subitement à 21 hres le soir, on est venu régler le problème en moins d'une heure. Nous avons des numéros de téléphone en cas de pépins et le service est impécable. Endroit parfait pour visiter la ville à pied, peu importe le quartier. La ville est merveilleuse l'hiver avec la neige en prime. Je recommande. we have made a very good experience with rentego. 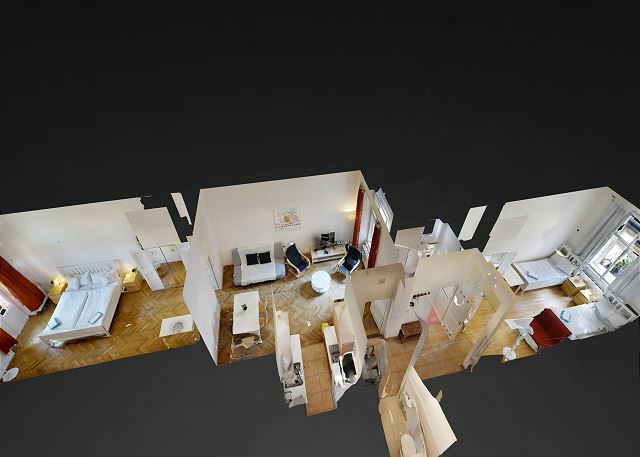 L'appartement répondait à nos attentes et aux informations transmises sur le site. Solution pratique, bonne autonomie grâce au principe du code. 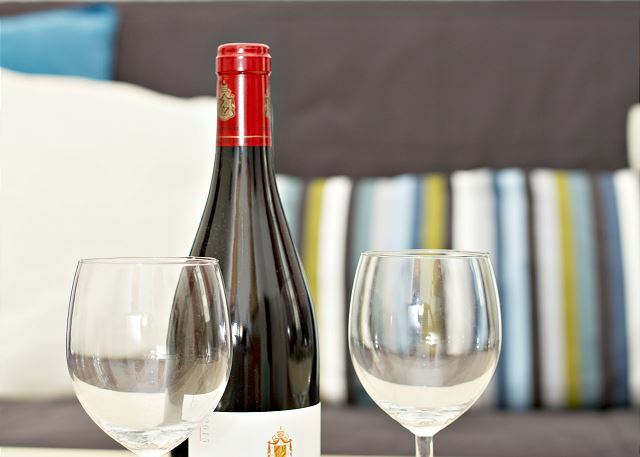 Appartement confort, bonne literie (lits assez grands comparativement aux standards tchèques). Très propre. Seul bémol: odeur du restaurant chinois situé en dessous. Fantastic Appartment - Good location - Enjoy Prha! Very happy to stay in this location, the appartment was clean, no key to share because of the pin code to enter the appartment. We had a wonderful experience. Renting the Prima apt was so easy and affordable. The floorplan was ideal for a family with kids as we could put our two little ones down to nap or to bed without them being kept up by noise in the other areas. Having the park next door was also great for the dogs. FYI, we didn't realize until the end of the stay, but if you go thru the small park and into the bigger park behind the fence, there is a GREAT playground for kids. No problem with this rental. Good accomodation, spacious,very easy to come in and come out (door code, time to check in and out etc...). To recommend! Pour améliorer l'information : pourquoi ne pas distribuer sur la table le dernier plan et tarif de trams très utile ! Aujourd'hui : 24 Kc tram et métro 30 mn avec transfer ou 32 kc 90 mn. The location is very handy for experienced travellers. Good tram connections. 45 mins to the airport and short walk to most sights. Very well located. Close to Prague Castle and Charles bridge. 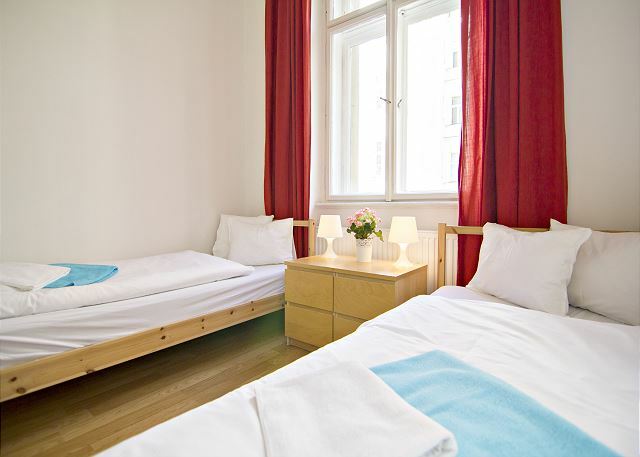 Large rooms fully equiped with good central heating and Wifi. At the corner a little supermarket and bakery. Clean and spaceous apartment in a very good condition. 5 min walk to Petrin Hill funiculair, 10 min walk to Little Glen's jazz club. 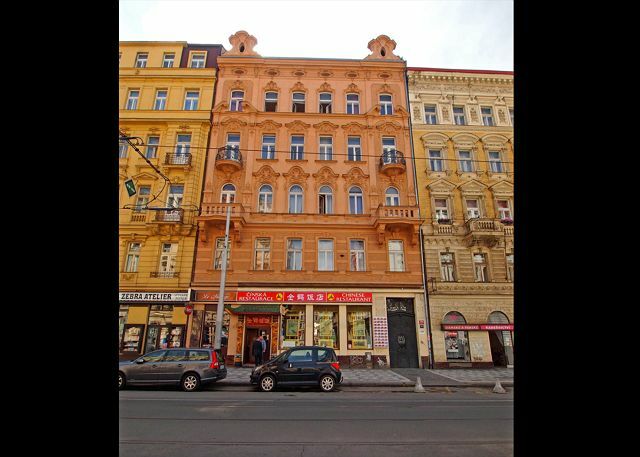 15 min walking to Novy Smichov Shopping Mall - overall excellent location. Tram stop just opposite the house - perfect connection to the rest of the city. Et oui malheureusement nous sommes rentrés. Nous avons vraiment apprécié notre séjour. Mes amis sont tombés sous le charme de votre belle ville. Pour ma part, c'était mon 5ème séjour à Praha, mais j'y ai pris autant de plaisir qu'à ma 1ère visite, même si beaucoup de choses ont changé en 15 ans. Nous avons également beaucoup apprécié le confort et l'équipement de l'appartement. Le contact avec l'équipe RENTEGO était excellent et nous les remercions pour les excellents conseils qu'ils nous ont prodigués. The apt. is well located for Smichov and the West Bank. Plenty of sights to see within wlaking distance and a tram stop outside. Well laid out and quiet at the back. The keyless entry and exit system is a bonus as anyone who has had 3 different keys in Prague will appreciate. Airport to Apartment is simple enough Either one change bus to tram or bus / tube / tram. As it stops outside this is a big bonus. Taxi drivers are confused when you tell them the street name so write it down. 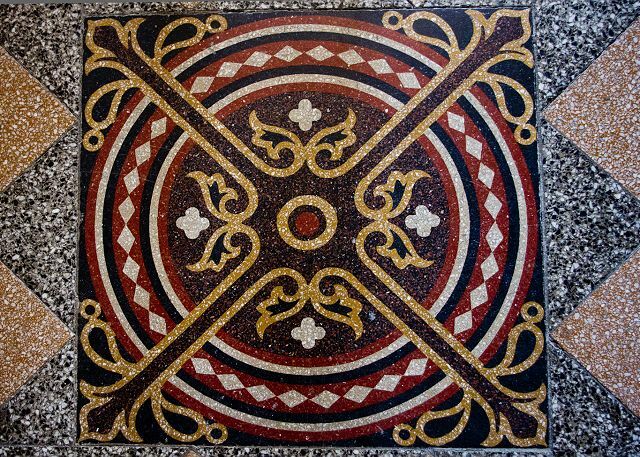 All in all an exellent time and a nice apartment, the team at rentego are friendly and helpful too. Parking We recommend you to use a guarded parking because of the high car theft risk - click here. Transfer For more info about transfer in Prague click here. Advices For other useful advices click here.